A few years ago I spent a couple days in Haifa. I was there around Christmas time and I was amazed at all of the Christmas decorations, the Christmas trees, the Santas. I forgot that there are Christian and Muslim Arabs and that Christian Arabs do celebrate Christmas. In Tel Aviv, there was nothing of the sort that I could remember or noticed. This seemed to have changed, a lot. Now that I live here, I’m able to see a lot more or maybe there is a lot more. For one thing, Christmas trees are a thing now. From stores in Jewish areas to large trees in Arab Jaffa, you can now actually see the trees. You can also see people walking around in Santa hats and Christmas decorations are sold in stores and hung in stores. It is strange to think that only a few days ago was Hannukah, and now Christmas seems to have sprouted. Of course, it is not like in the US. There are no big sales, the decorations I talk about are seldom and not overdone. The 2% of Christian Israel seems to be over-represented, especially compared to the amount of Hanukkah things you see in the US, which is virtually non-existent. On the actual Christmas Steph and I went out. We went to a Christmas event at a local food court where we saw a Jewish take on Christmas: everyone had weird glasses with Santas wabbling off of them like antennas. There was a Christmas tree, egg nog and everything was festive. Families were eating, people were drinking wine and beer and playing games, which seems to be a specialty at this food court. The big difference, of course, is that in the US, everyone is at home and virtually nothing is open. It was one of the things that made me feel like such an outsider, I had nowhere to be and thus felt completely alone as all others seemed to be spending something important with their family. We went to a huge party at the Abraham Hostel. People were streaming in dressed up in Santa hats and cheesy sweaters. We played a round of pool after getting some beers. The special was three shots for 36 shekels ($10 bucks). The place was packed with American ex-pats, Europeans, birthright trippers, and Israelis. It felt strange to be at such a huge party on Christmas. It reminded me of the annual party for Jews in San Diego, but bigger and more fun. It made me happy. As we left the drunken debauchery, we walked along a street. This was a Sunday night and the stores were full. We dropped by a Max Brenner Chocolate place, full to the brim. Then we went and got some waffles and ice cream. After we indulged in this delicacy, we walked and passed a lot of American Jews in the streets. It seemed that all Israelis were home and American Jews had a need to be out on this Christian holiday. I had a realization of just how deep American culture permeated American minds. Even Jews, with their desire to be different and abhorrence of Christmas because of the thousands of years of persecution, had a need to feel Christmas, the spirit and culture that they grew up with, even if they never got to participate. Only in Israel, I thought, would Jews feel free and normal celebrating Christmas. 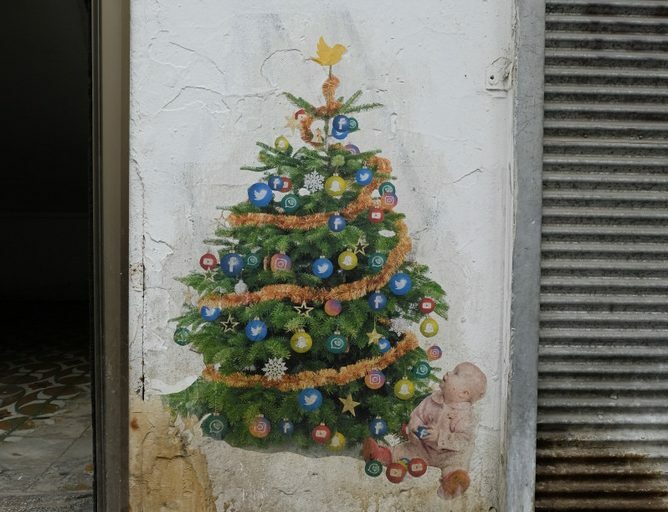 This entry was posted in Uncategorized and tagged Christmas, Israel, Tel Aviv. Bookmark the permalink.